Hold it! 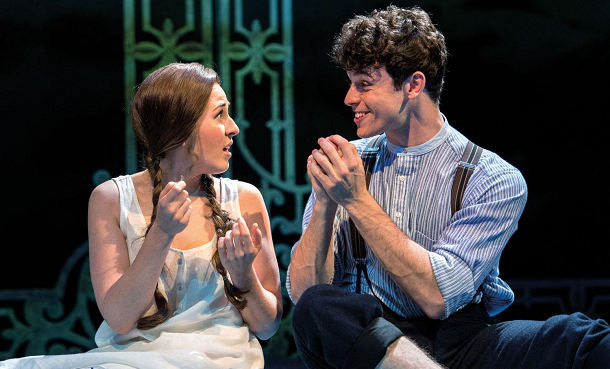 Half a Sixpence flashes, bangs and wallops into the West End, fresh from a rave run at Chichester Festival Theatre. David Heneker's 1965 musical that shot Tommy Steele to a newfound fame has been expanded, padded out and transformed in this new version by duo Stiles and Drewe, and recent School of Rock writer Julian Fellowes. It's a sure-fire vehicle for the lead, and Cameron Mackintosh has landed himself a keeper in 22 year-old Charlie Stemp as Arthur Kipps, who carries the entire show with more grace and ease than most seasoned performers. Paired with a sweet, silky voice, Stemp is a mesmerising dancer, with boundless energy and a cheeky grin to match. Playing opposite Devon-Elise Johnson, the two are entirely endearing and it's so refreshing to see new faces on the stage (including an almost show-stealing turn from Bethany Huckle as Flo). Director Rachel Kavanaugh has secured an excellent cast with Emma Williams and Ian Bartholomew, who recently received Olivier nominations for Mrs Henderson Presents. Whilst Williams' Helen Walsingham is pretty unlikable from the off – you almost wish there was something more to her character, as it's pretty clear she has more morals than money – she is a safe pair of hands for the role. Ian Bartholomew is a breath of fresh air as the doddering Chitterlow who comes to save the day (twice). Half a Sixpence is the ultimate “traditional” musical; charming, fun and full of sheer joy, packing in plenty of stand-out numbers to hum on the train home. “Pick Out a Simple Tune” is a show-stopper, involving the whole cast bashing on metal instruments and dashing about the stage. Equally, Heneker's original “Flash, Bang, Wallop” gets the biggest applause of the night, and deservedly so. You only wish the sound in the theatre was a little louder! There are several things that make this musical so special. Paul Brown's seamless designs ensure the action is fast-paced, Andrew Wright's choreography is simply terrific, and Charlie Stemp is a star on the rise. It's the tight ensemble and boundless energy that causes you to leave the theatre with the biggest smile on your face – it may be slightly “old-fashioned”, but it's impossible not to love.